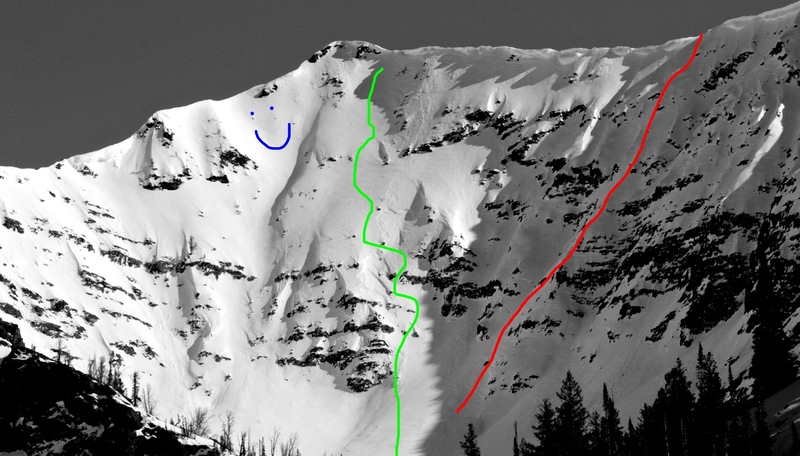 After scoping some cool lines in the vicinity of the Trail Creek road during our last trip over the pass, we decided to make an attempt on Summit Creek peak via a steep, semi-technical climbing route followed by a mellow ski descent back down (on the route picture, red is up; green is down). The day before the attempt, we headed off from the van in the late afternoon with very heavy packs filled with plenty of climbing and ski gear. We made it to (very mushy) snow within 30 minutes and skinned for another 2 hours or so to reach camp at about 8400′ in the basin below Summit Creek peak. Luckily we found some freshly melted out ground for the tent, which we promptly set up and crawled into after a quick dinner. When our alarm went off at 4am we quickly fired up the stove to heat some water for our oatmeal, which we quickly consumed before hitting the snow. 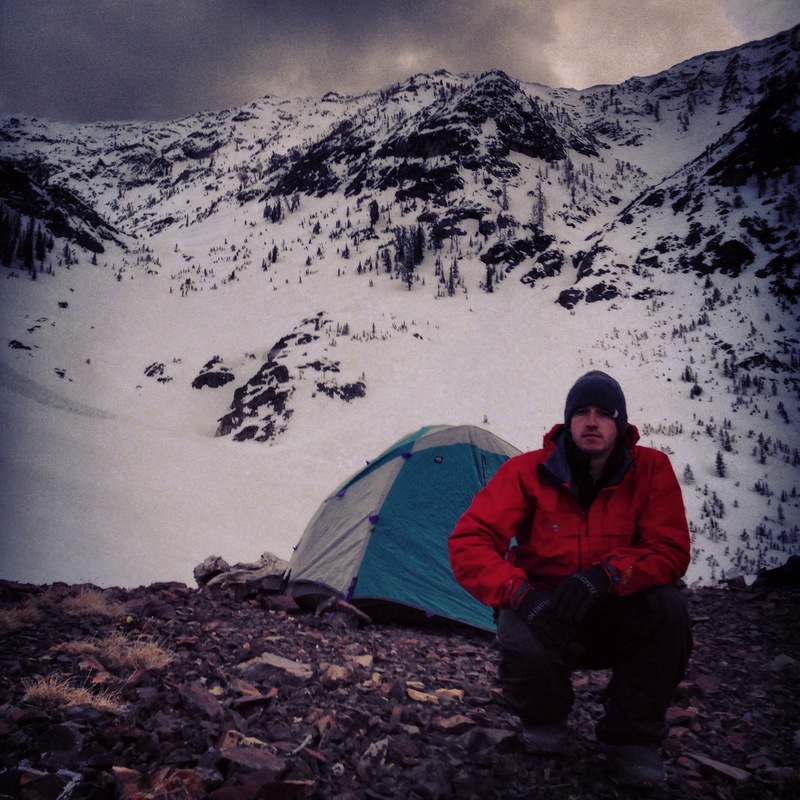 At 430am the snow felt good and hard near camp – things were looking good! However, not 30 minutes later as we headed up a steeper slope into the higher basin did things begin to change. 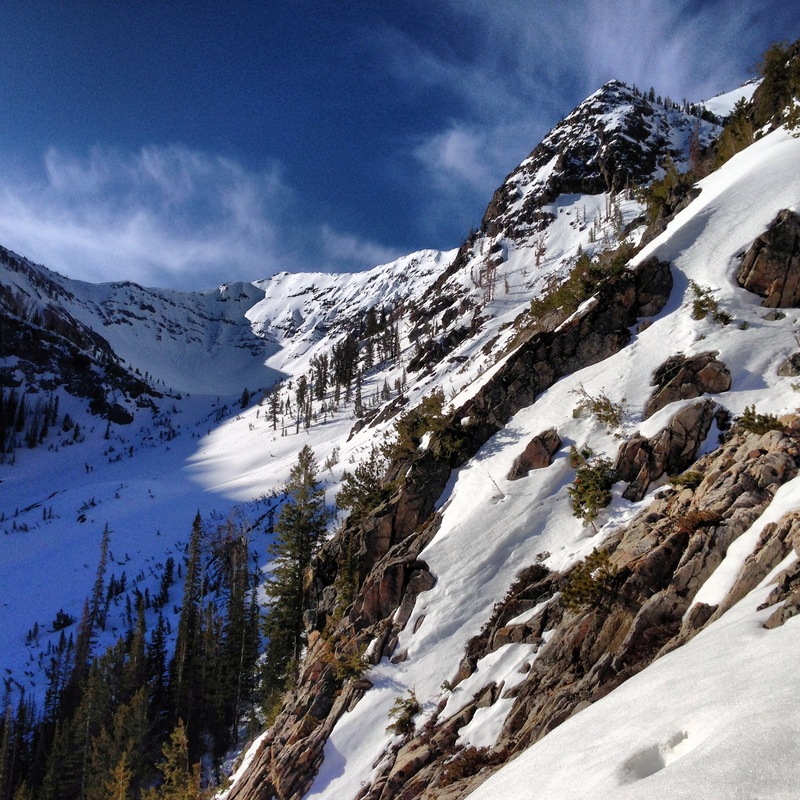 As we got on to the deeper snowpack, we realized only the top 4 inches or so was frozen solid – a result of the slow transformation process (no thanks to the recent high nighttime lows) of our layered, faceted winter snowpack into a solid spring/summer snowpack. While skinning we began to collapse through this top layer and found ourselves swimming in feet of sugar – hardly the type of snow we were looking for to climb a near 50 degree snow line. Conditions continued to deteriorate to the point where we could make almost no upward progress through the snow. With the sun shining bright and beginning to heat things up, we decided to abort. We clicked into our bindings and skied carefully back to the tent. 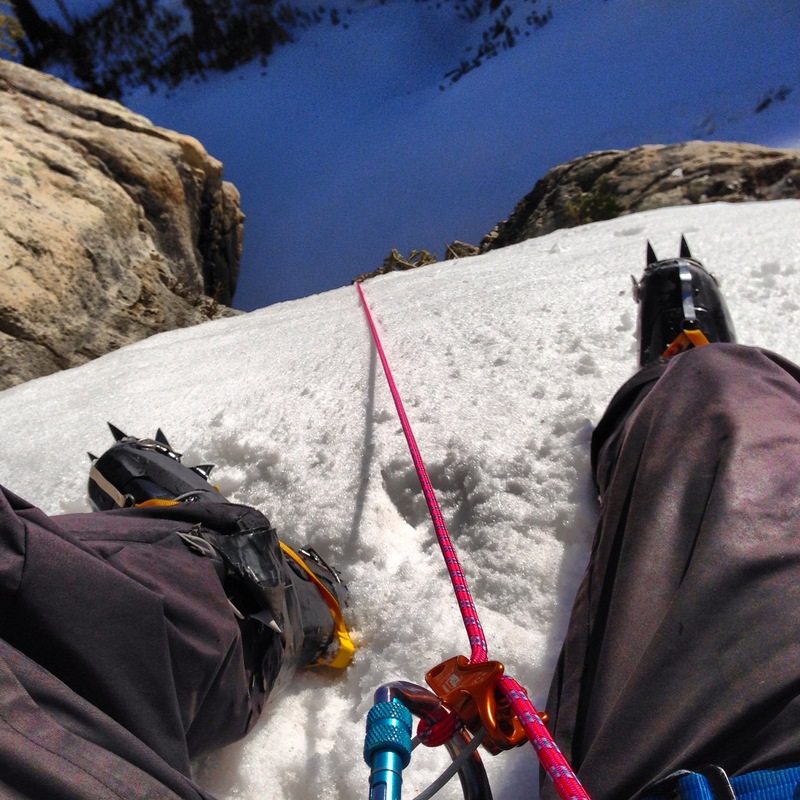 Wanting to make the most of our failed mission, we decided to practice our roped climbing and anchor skills by climbing a short couloir near camp. After that, we packed up and skied one of the most unenjoyable sections of snow back towards the car. 55+ pound packs and skiing through pine bough covered snow with patches of dirt every couple hundred feet is no fun. After a rough final stream crossing, we finally made it back to the van! 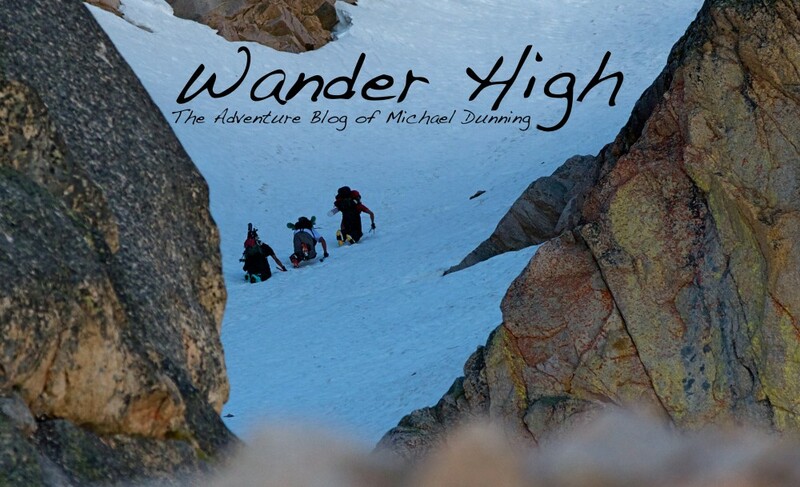 This entry was posted in adventure, climbing, outdoors and tagged alpine, alpine climbing, athletes, backcountry, climbing, extreme, idaho, mountaineering, mountains, photography, photos, rock climbing, ski mountaineering, skiing, snow, sports, spring, summer, sun valley by wanderhigh. Bookmark the permalink.